Employment was little changed (+12,000 or +0.1%) in August. However, the unemployment rate increased 0.2 percentage points to 7.0%, as more people searched for work. Prior to August, the unemployment rate had held steady at 6.8% for six consecutive months. An increase of 54,000 in full-time employment in August was mostly offset by a decline of 42,000 in part-time work. Compared with 12 months earlier, employment was up by 193,000 or 1.1%. Over the same period, full-time work increased by 318,000 (+2.2%) while part-time declined by 125,000 (-3.6%). At the same time, the total number of hours worked rose 2.1%. In August, employment increased among women aged 55 and older, while it edged down for men and women aged 25 to 54. There was little employment change among the other demographic groups. Provincially, employment rose in Saskatchewan, Newfoundland and Labrador, Manitoba and New Brunswick. There was little change in the other provinces. Employment increased in public administration and educational services, while it was little changed in the remaining industries. 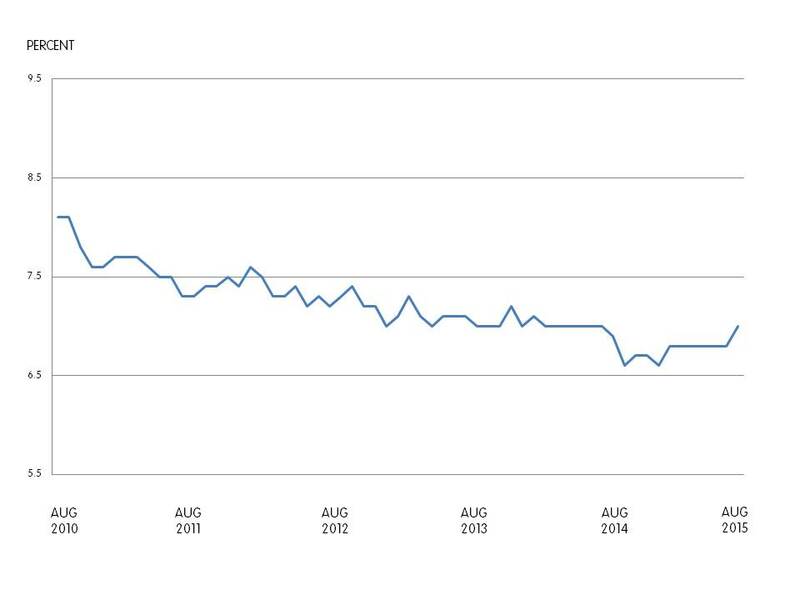 The number of public sector employees was up in August, while self-employment edged down. At the same time, private sector employment was little changed. For women aged 55 and older, employment increased by 29,000 in August, contributing the bulk of the year-over-year growth of 35,000 (+2.2%). Their unemployment rate in August was unchanged at 5.4%, as more of them participated in the labour market. There was little change in the employment level of men aged 55 and older, and their unemployment rate was 6.7%. In the 12 months to August, there were 77,000 (+4.0%) more men employed in this age group, largely the result of growth in their population. For men and women aged 25 to 54, employment edged down in August, pushing their unemployment rate up 0.2 percentage points to 5.8%. However, compared with 12 months earlier, employment for this group increased by 90,000 (+0.8%). Employment among youths aged 15 to 24 was virtually unchanged and their unemployment rate was 13.1% in August. On a year-over-year basis, there was little change in both the employment level and the unemployment rate for this age group. Employment in Saskatchewan increased by 4,000 in August, partly offsetting a decline the previous month. The unemployment rate fell 0.5 percentage points to 4.7%, still the lowest among all provinces. Compared with 12 months earlier, employment in the province was little changed. In Newfoundland and Labrador, employment rose by 3,100 in August and the unemployment rate was 11.5%. On a year-over-year basis, employment in the province was little changed. In Manitoba, there were 2,700 more people employed in August. However, as more people participated in the labour market, the unemployment rate was little changed at 5.7%. Compared with a year earlier, employment gains in the province totalled 8,600 (+1.4%). Following three months of declines, employment in New Brunswick increased by 2,400 in August, pushing the unemployment rate down 0.9 percentage points to 10.1%. Compared with August 2014, however, employment in the province was little changed. Despite little change in employment for Quebec, an increase in the number of people looking for work pushed the unemployment rate up 0.3 percentage points to 8.0%. In the 12 months to August, employment in the province increased by 40,000 (+1.0%). In Ontario, employment was also little changed in August, and the unemployment rate increased 0.4 percentage points to 6.8% as more people searched for work. Compared with 12 months earlier, employment rose by 64,000 (+0.9%). There were notable increases in full-time work (+145,000 or +2.6%), which were partially offset by part-time losses (-81,000 or -6.0%). In Alberta, employment was little changed in August and the unemployment rate remained at 6.0%. On a year-over-year basis, employment gains totalled 41,000 (+1.8%). However, there has been no overall employment growth in the province so far in 2015, and the unemployment rate has increased 1.3 percentage points over this period. 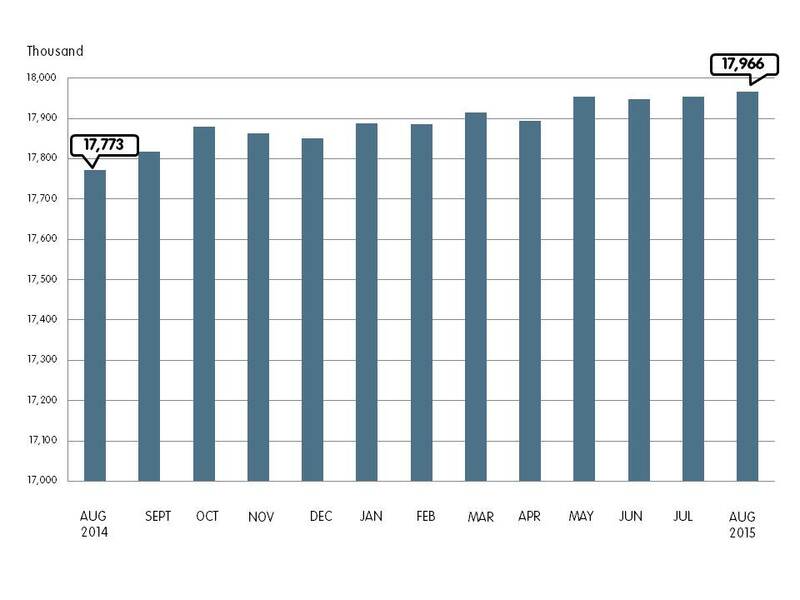 Employment in public administration increased for the third consecutive month, up 14,000 in August. These recent increases offset earlier declines, leaving employment in the industry virtually unchanged compared with 12 months earlier. In August, employment rose by 11,000 in educational services, continuing the upward trend that began earlier in the year. Compared with August 2014, employment increased by 53,000 (+4.2%), with most of the gains in postsecondary institutions. Public sector employment rose by 27,000 in August, contributing to a year-over-year increase of 67,000 or 1.9%. The public sector includes all employees in public administration, most employees in utilities, as well as some employees in education, health care and social assistance, transportation and warehousing, and other industries. While the number of private sector employees was virtually unchanged in August, it was up 124,000 (+1.1%) compared with August 2014. Self-employment edged down in August, but was virtually unchanged compared with 12 months earlier.